Titan Medical's Sport surgical robotic system closely shadows Intuitive Surgical's DaVinci--but at a much lower cost. Titan Medical, Canada and Ximedica LLC have infused new life into Titan's Sport surgical system, which has been in process for the past several years. 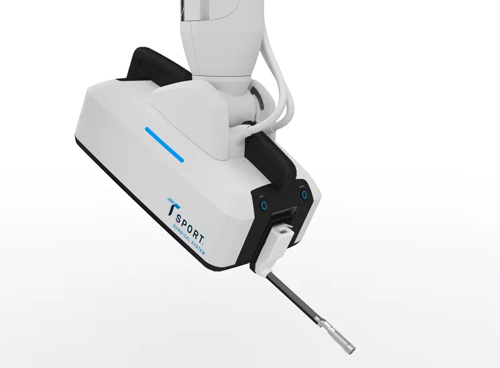 After many years of development, Titan revealed the first functional prototype of Sport in March 2016 at a meeting held by the Society of American Gastrointestinal and Endoscopic Surgeons. The newly announced development plan that Titan and Ximedica are kicking off will infuse new energy into the final stages of development and test of the robotic system. The Sport system very closely shadows Intuitive Surgical's DaVinci surgical system, but at a much lower cost. It targets the minimally invasive surgical market, including a broad set of surgical procedures for general abdominal, gynecologic, and urologic indications. "Ximedica is a valued partner and this agreement enables us to resume the development of the Sport Surgical System. This agreement and the decisions by the Board of Directors earlier this week demonstrate the committed effort of our company to advance the Sport Surgical System," John Barker, interim CEO of Titan Medical, said in a news release. Randall Barko, President and CEO of Ximedica, added: "We believe the Sport Surgical System represents a significant technology and everyone at Ximedica is proud to be associated with its continued development. Our development team is re-engaging and our objective is to deliver on Titan's milestones." Check out the latest in medical device manufacturing automation on the expo floor of BIOMEDevice San Jose, December 7-8, 2016. The Sport system's unique design elements allow for superior clinical capabilities and unparalleled OR efficiency at operating costs similar to laparoscopic surgery. The design of Sport is inspired in direct response to "voice of customer" feedback from current laparoscopic surgeons and robotic users, surgeons as well as administrators and Titan's Surgeon Advisory Board comprised of world-renowned multi-specialty surgeons affiliated with leading institutions, including Columbia University, Mayo Clinic, and UCLA. This compact robotic system is comprised of an innovative, surgeon-controlled robotic platform that includes a 3-D high definition vision system and multi-articulating instruments for performing MIS procedures and a surgeon workstation that provides the surgeon with an advanced ergonomic interface to the robotic platform for controlling the instruments, as well as a 3-D view inside the patient's body cavity during MIS procedures. The surgeon-controlled robotic platform incorporates a 3-D high-definition vision system and multi-articulating instruments for performing MIS procedures through a single incision. The surgical system also includes a surgeon workstation that provides a surgeon with an advanced ergonomic interface to the robotic platform for controlling the instruments and provides a 3-D high-definition endoscopic view of inside a patient's body. The Sport Surgical System is designed to enable surgeons to perform a broad set of surgical procedures for general abdominal, gynecologic, and urologic indications. The system's multi-articulating, interactive, snake-like instruments are designed to couple with removable and sterile single patient use robotic tools. Titan plans to receive CE Marking for Sport in Europe by the fourth quarter of 2017, and FDA approval in the U.S. by the first quarter of 2018. Joyce Laird is a contributor to Qmed.